Life as a parent is exhausting. We spend all our time working for and worrying about our kids. Day or night. It doesn’t matter if you’re awake or asleep. If you are a parent, you are on duty — and it can be stressful. Parental burnout is a real thing. The exhaustion that comes from weeks, months and years of trying to function as a contributing member of society on zero sleep is mind-boggling. You’re not just tired, you are bone tired. Whether you work outside the home or not, all moms and dads work hard. However, there is no question that trying to maintain a career takes the unpredictability up a notch. I’ve been a working mom since I had my first child three years ago. Since then, we’ve also added twins to the mix. Three kids in three years, and I’ve been a working mom every step of the way. Sometimes I’ve worked more and sometimes I’ve worked less. I’ve worked in the office and I’ve worked from home. In this current season of life, I work exclusively from home as an attorney and writer. I know what it’s like to balance life, kids, career, relationships, self-care and all the other things that come along with being an adult. But that doesn’t mean it’s always easy, and I’ve had more than my share of hilarious working-mom fails. There are days I’ve left the house wearing an inside-out sweater. Days my son spilled milk on my work outfit moments after we left the house. There’s also the time I left the house wearing two different shoes and didn’t know until my mother-in-law told me when I dropped my son off before work. Apparently, I’ve had a lot of motherhood-related wardrobe fails. But I’ve also had other kinds as well. I can’t even tell you the number of times I’ve been on a conference call or on the phone with opposing counsel or even on a call with a judge while my son hollered about something in the background. Sorry about that, Your Honor. We all remember BBC Dad and how hilarious it was to watch his children burst into the room during an internationally televised interview. It’s funny because it’s relatable. As parents, we’ve been there. We know what it’s like, and occasionally, it’s nice to know we’re not the only ones saving face when a wily toddler suddenly appears on videoconference. 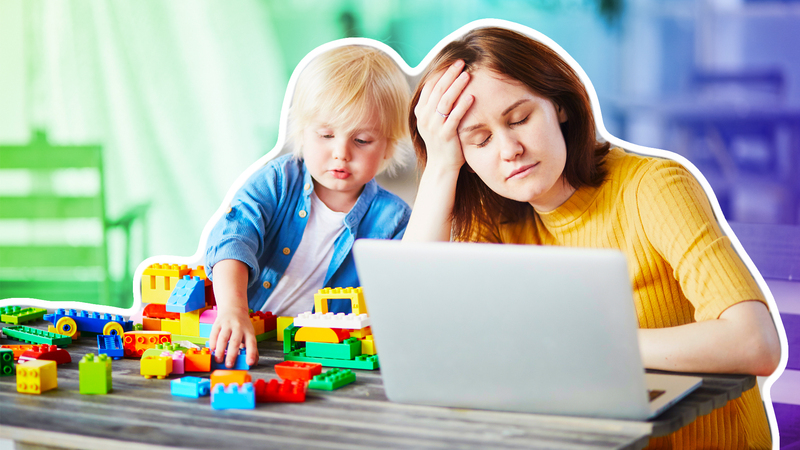 That’s why we asked real working moms to share their hilarious working-mom fails — and boy, did they come through. Their stories will make you laugh. They’ll make you cry. They’ll make you wish you hired a babysitter. But more than anything, they’ll make you appreciate that we’re all in this together. “I gave day care some spare clothes for my 3-year-old at the beginning of the school year. He didn’t need to use the spare clothes for a long time. One day in December, I arrived after school and found him dressed in a classmate’s pastel Frozen sweatshirt and mismatched leggings. Apparently, I forgot to update day care with a set of winter clothes, and the only ones he had were shorts and tank tops from August. They had no choice but to scrounge around for something else. Face. Palm.” — Katelyn K.
“My mom came over to watch my son while I went downtown to take care of something work-related. I was five-months pregnant with twins and had a lot on my mind. As I pulled out of our driveway, I completely forgot my mom’s car was there and crashed right into it, side-swiping her door. I don’t want to blame pregnancy brain, but that was definitely pregnancy brain.” — Candace Alnaji (yes, this is my story!). If these made you laugh, be sure to share your hilarious working-mom fails with us.